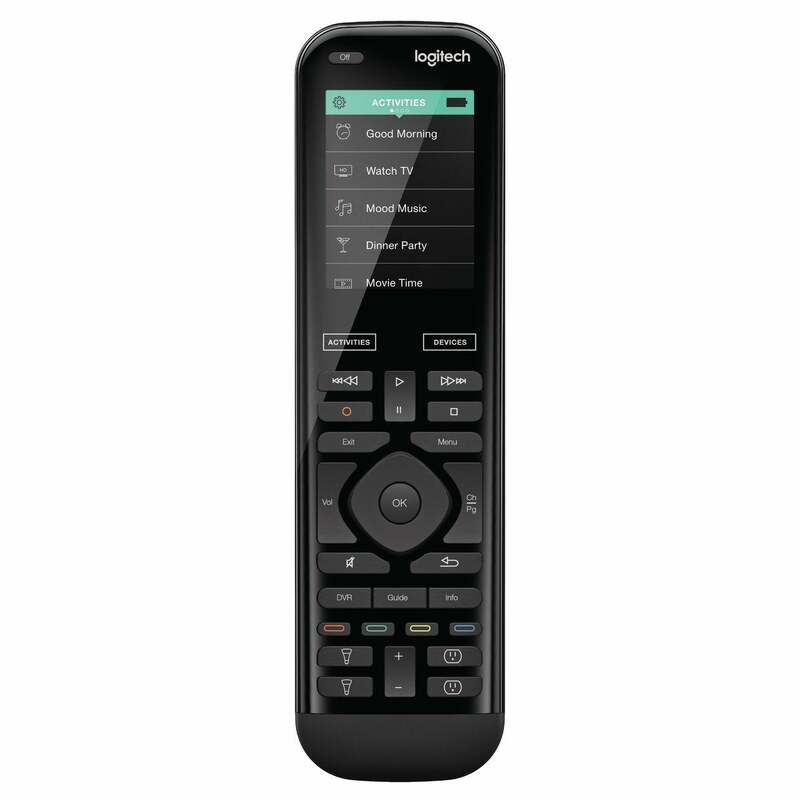 Without question, the slickest universal remote on the market is the Logitech Harmony Elite. It’s obvious from first glance, largely owing to the large touchscreen that dominates the top third of the remote. Like the Harmony Companion, the Elite consists of two parts. First is the Harmony Hub, an IR blaster that plugs into the wall and which is the same as the standalone Hub and the Hub included with the Companion. The Hub is configured either via smartphone app or your PC (the latter is more powerful and less error-prone). Second is the remote itself: As with the Companion, it’s an RF remote whose primary job is to send commands to the Hub, which can in turn be relayed via infrared, Bluetooth, or Wi-Fi. However, unlike the Companion, the Elite also includes an additional, integrated IR blaster, so if your Hub isn’t perfectly placed, the remote can be configured to also send commands directly to your entertainment devices. Setting up devices via the Windows app (vs. a mobile app) makes things easier and less prone to mistakes. The difference here is how the remote handles those commands. The physical keys that make up the bottom two-thirds of the remote are largely expected, though they’re kept generic enough to be appropriate for nearly any type of entertainment device. Notably lacking: numeric buttons, which are only found on the touchscreen menus. 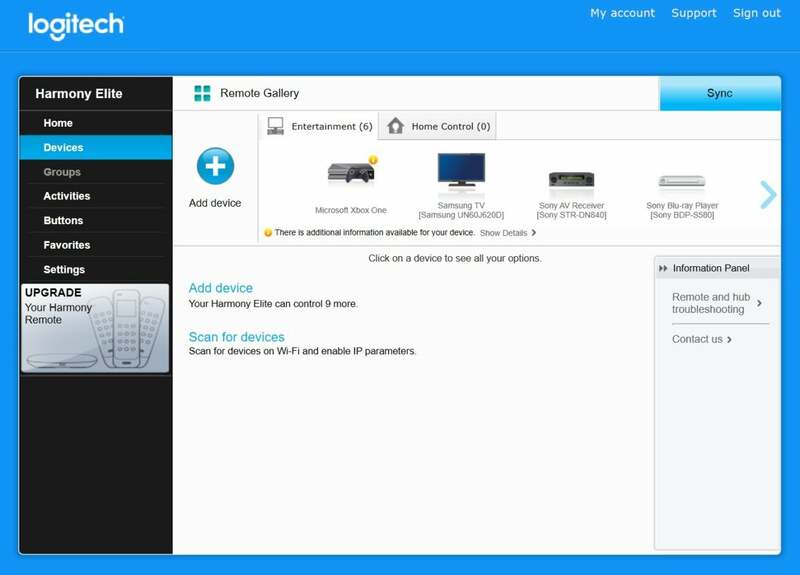 As with all Harmony Hub-based remotes, the Elite is built around “actions,” multi-step processes that you configure through the mobile or Windows app and which control multiple products in a sequence. A “Watch TV” action will turn on the receiver, turn on the TV, and set the proper inputs. Get fancy and you can tie this all into your smart home gear, too, so the lights dim appropriately when you fire up Game of Thrones. The Elite shines when you are interacting with the touchscreen. It doesn’t get much more intuitive than picking up the remote—which wakes on motion—and tapping “Watch TV,” which instantly appears at the top of the color screen. Your devices fire up in quick succession without any additional effort. Switching channels is a snap: You can set up to 50 favorites, which appear as icons on the display. Jumping between HBO and Comedy Central is a one-tap affair, with no need to resort to the guide channel or tap in a bunch of digits. (Though, of course, you can do both of those things if you so desire.) For each action, the commands that appear on the touchscreen are fully customizable, so you can drop in commercial skip buttons, extra volume controls, or just about anything else. A spacious touchscreen makes key shortcuts easy to find. Things get a bit hairier if you need to delve past the commands you’ve designed specifically for your actions. If you need to dig into a more complicated setting, it’s easy to switch to single-device control by selecting the specific product you want to command, but this locks you out of simultaneously controlling anything else. For example, I found I often switched to manual control of my cable box, but this locked out the volume controls that are routed through my receiver. In single-device mode, there’s no way to map buttons to another device, even though, in this example, the volume buttons don’t do anything when controlling the cable box. That said, for the most part, working with the remote is straightforward and can even be fun. It was so much simpler to use a real remote control to watch Hulu via my Xbox One instead of having to deal with the clumsy Xbox game controller that I may never look back. Aside from the touchscreen control, the Elite offers a few other nice upgrades over the Companion and Hub. First, it can control up to 15 devices, while the Hub and Companion are both limited to eight. Second, and this is the biggie, you can sync changes wirelessly, by tapping a command in the settings function of the remote itself. The Hub and Companion must be physically plugged into your computer to sync if you configure them through Windows; not so with the Elite. Finally, the remote includes a rechargeable battery and a docking station, so you’re much less likely to lose it. The bad news: At nearly twice the price of the Companion, you have to really think hard about whether the very high cost of the Elite is worthwhile. If your home theater (and/or smart home) setup isn’t inordinately complex, one of the other remotes on this list might make for a better buy.